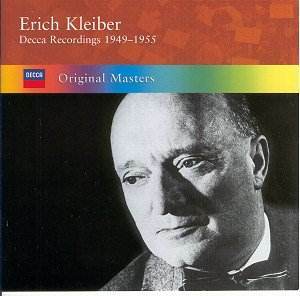 Erich Kleiber�s relatively slender discography has long needed a degree of consolidation. The scattering of recordings on Decca singles, the Great Conductors of the Century series and on Amadeo (the Cologne recordings) has been frustrating for collectors; this box of the 1949-55 Deccas in their Original Masters series will therefore be greatly welcomed and proves to be especially useful to those who wish to analyse Kleiber�s way with the Eroica and the Pastoral � both of which exist in two recordings � and maybe to acquaint themselves with those recordings they may not previously have encountered, the Weber Symphony for example or even the Choral Symphony, which has certainly not enjoyed the currency of some of his other Beethoven recordings. Let�s start with the Concertgebouw Eroica, recorded in May 1950. Demerits are the lack of the first movement exposition repeat (which accounts for the timing difference between this recording and that made in Vienna three years later where Kleiber plays the repeat), a few orchestral imperfections, and an idiosyncratic luftpause in the Scherzo, which was something he clearly brooded over because he rectified it in Vienna. In addition the recording is slightly constricted and doesn�t really expand enough to catch Kleiber�s climaxes. Whilst I prefer the later recording, however, this one has profound things to say � not least in the constant battle between orchestral fluidity and dynamism and between vigorous string clarity and orchestral sonority generally. Kleiber�s horns evince a sense of total drama in the first movement and in the funeral march there is a coruscating depth. The Vienna recording has all the virtues of the Amsterdam, plus the advantages of the restoration of the repeat and a better Scherzo; it�s also much better recorded and rather better balanced as well. The strings are warmer than those of the Concertgebouw, which are hampered by a degree of vintage Decca shrillness. The Fifth saw Kleiber back in Amsterdam a few months after recording the Eroica in Vienna. Again the strings are a bit harsh � Decca clearly had problems in this hall in the late 1940s and early 1950s � and there�s a distinct lack of bloom to the sound. I find it difficult to be objective about the performance not simply because it is so famed but also because it was one side of the first LP I owned. Trying to put nostalgia to one side it still seems to me a magnificent achievement � fiery and forward moving (but not driven) in the first movement with moments of lyric elasticity emerging naturally from the music�s fabric, and acute attention paid to the dynamics of the slow movement, a profound union in Kleiber�s hands of the songful and the serious (it even achieves an almost quasi-operatic effulgence). Similar praise for the Amsterdam Pastoral. Comparison with, say, Ančerl�s warm heartedness in this work might lead one to think Kleiber cool and aloof but the latter�s virtues are ones of the most acutely penetrating insight in the architecture and sense of fluctuation inherent within it � of tempo and feeling. The Concertgebouw performance is greatly to be preferred over the earlier 1948 LPO traversal. Clearly the master tape was problematic here because there are all manner of preserved bad edits and misaligned side joins � try 4.27 in the first movement � where we lose rhythmic impetus after the opening 78 side, 3.59 in the second movement, 2.57 in the fourth and 6.07 in the fifth � allied to which there�s no repeat in the Scherzo. Coupled with the London Pastoral is the 1949 Mozart G minor, sans clarinets, sans exposition repeats, with somewhat etiolated Decca violins but good basses. Despite the sonic imperfections this adds up to another magnificent piece of conducting � the record by which I "learned" this symphony - fast and fluent in the Molto allegro, energetic and full of brio in the finale (which has a few ticks it must be noted) and crafted with firm, if affectionate, direction in the slow movement. The Cologne performances are preserved in somewhat constricted sound but they give us Kleiber�s Weber, in which he perfectly catches the symphony�s pomposo elements as much as the more overtly romanticised gestures that aerate the Andante. The same session gave us Mozart�s E flat major symphony as well as the ebullient little Dances. The Symphony amplifies the very qualities that so admirably exist in the G minor � lyricism, never easily won, allied to strong structural awareness, balancing of sections and string choirs, an inevitably right sounding tempo. The Schubert Ninth comes from Cologne but was recorded about two years earlier than those last 1956 sessions. Caveats first � the recorded sound is really pretty basic, light in the lower frequencies and constricted in a way recognisable from those later �56 sessions. Yet what a performance. Dynamic, incisive, full of momentum and grandeur this reading has myriad shades of dynamic variance, which survive even the poor recording. Kleiber�s sense of finesse and forward-looking intelligence - intellectual, intuitive � makes of this work a real case study in sympathetic symphonic dynamism. He is not at all the hustling Toscanini acolyte that some have found in his conducting; whatever he conducts and however initially brisk and disconcerting it may seem, there is always time to breathe, always sufficient metrical plasticity to let melodies unfold at their proper speed. And then to Beethoven�s Ninth, his Vienna recording of 1952 � there doesn�t seem to have been a concerted effort to get Kleiber�s cycle on disc, which accounts for the multiple re-recordings and the lacunae in his recorded legacy. Yes, certainly Furtwänglerians will recoil form the gimlet precision of the opening movement but no one could doubt the splendidly controlled and rhythmically precise Scherzo, with prominent wind solos taken with such tonal idiosyncrasy. The slow movement is prayerful but the finale has a few glitches � the choir can sound woolly, there�s some blasting, particularly on fortes, on the master tape (I assume it�s the master tape) � an especially unfortunate passage is from 8.10 to 8.15 and again a minute later at 9.10. The solo quartet is is amongst Vienna�s finest at the time and responds well to Kleiber�s operatic sweep though they can be variable vocally. On balance whilst not quite as impressive as his other extant examples of Beethoven Symphonies this is a classically conceived and tightly argued traversal and as with so much of Kleiber�s Beethoven and Schubert it points a way forward to a more streamlined aesthetic. Housed in a double CD sized box and with brief but pertinent notes this is a mandatory purchase for admirers of the conductor. Obviously there are imperfections and weaknesses, not least in the master tapes; there is repertoire duplication as well, something of a given in Kleiber�s case. But the command is palpable, the symphonic shaping utterly persuasive, the musicianship sovereign.